Katie Wohl is the talented artist behind Katnawlins. Born and raised in the fabulous city of New Orleans, LA, she currently lives in Los Angeles, but is constantly inspired by her hometown. She creates original and unique pieces (iphone cases, prints, pillows, etc.) based on her acrylic paintings and colored pencil drawings. "Everything I create is inspired by the funky & lush beats of New Orleans." She seriously has so many fun patterns! I just love all the bold, geometric designs she creates! Wouldn't you just LOVE seeing one of these fun cases on your iPhone? Well, Katie has been so generous to offer up one case, to one lucky reader! To enter simply use the Rafflecopter tool below. Promo code valid on US orders only. Expires Sept. 1, 2013. I so badly need a case! I love these. I would get the mint triangles and chevron. o my lord any patterned one is beautiful and I would so gift it to my dad his Iphone is so naked!! 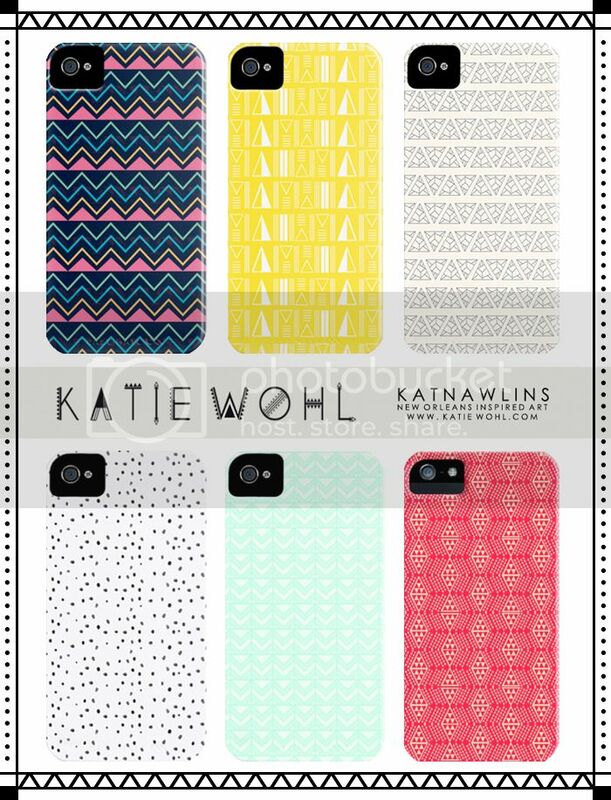 I would probably want the pastel IKAT case. They are all so awesome! The floral ikat! There are so many amazing ones to choose from though! Oh my gosh look how cute!!! I just entered and fingers crossed that I win because those are sooooo adorbs!!! The first Aztec and the mint and the yellow...yes, please!! OMG. love all these designs! They are so pretty! So many designs, hard to narrow down one but I do like mosaic triangles. Great giveaway Jessica! Katie has so many really fun cases, but I like 'Southwestern Geometry' the best! I looove the white with tiny black dots one! I like the Floral Morning case! i'd pick the mint tiles one! OH MY!! I love them all! !